Betlem Club is a luxuriously equipped hotel for convenient prices in Prague 1, in the Old Town. Old town Prague hotel is situated in a medieval house in the centre of the old Prague. Betlem Club, hotel in Prague 1 (Old Town), is situated in the core of the historical centre of Prague. The old town square hotel is surrounded by the most important sights of Old Town Prague and places such as the Charles Bridge, the National Theatre, the Old Town Square, Wenceslas Square, the Royal Way and the Jewish Town. 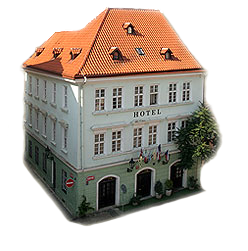 We offer one of the most convenient prices for accommodation in Prague 1 - our old town square Prague hotel disposes of 21 well appointed rooms, offers its own pick-up service with transport to/from the airport or railway station and to/from location of our hotel in Prague 1 - Old Town. Old town Prague hotel Betlem Club is situated in historical Prague centre, it is an ideal starting point for your unforgetable walks through Old Town Prague and for longer weekend breaks to Prague.